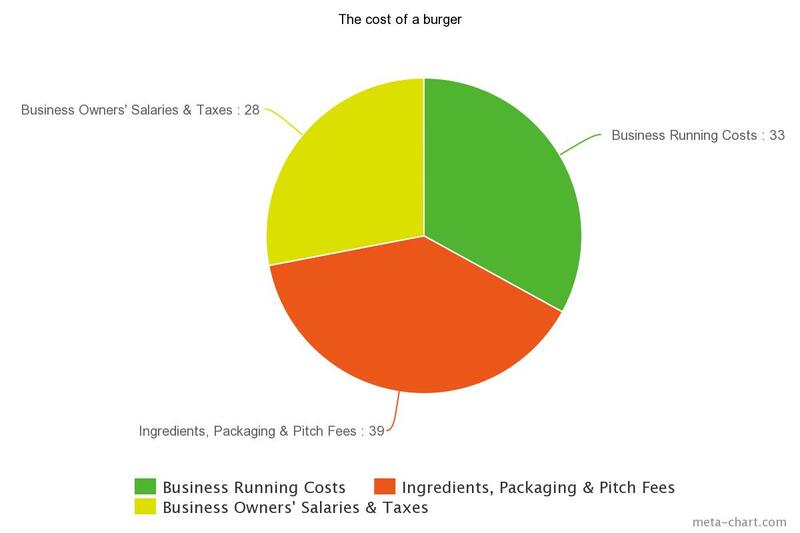 The true cost of a burger – an insight into street food pricing. We have seen and heard a few comments recently from people online and out and about who have questioned the price of our street food. Whilst we know that we provide you with lovingly handmade, organic, vegan, fair trade and locally purchased (from independent businesses where possible) food, we understand that anyone who hasn’t worked in the food industry may wonder where we dream up our prices from, given that you could probably make a vegan burger yourself at home for far less. Well today we are opening the doors to our business and revealing just where the price of your burger comes from, in order to shed some light on the hidden costs of running a food business and in the name of transparency and fairness. Our prices are very much on a par with most street food businesses who run them as a full time career as opposed to a supplementary income on top of another income stream. We are not just referring to vegan food either, but most burger prices across the street food businesses in Birmingham range from £6-£8 depending on the burger, double/single, toppings etc. Our prices are the same. This shows you that we are not exploiting vegans as they have little choice, even the meat eaters of Birmingham with their choice of dozens of street food options at a time pay these prices. So where does the price come from? Do we make it up? In a word, no. Professional Membership, Gas/Electric Safety Checks, Ingredients, Biodegradable packaging, Trailer & Maintenance, Equipment & Utensils, Gas/Electric for cooking on and off site, Diesel and car maintenance, Car insurance, Trailer Insurance and Public Liability Insurance, Finances/Accounting/Banking Fees, Staff costs, Marketing, Cleaning, Uniforms, Storage for stock, Secure Parking for trailer, Pitch Fees, Waste Stock and Charitable Donations. In monetary terms this equates to £1 per burger each for us. Based on our average sales this works out that we each earn £3.12 per hour for every hour we work on our business which is around 80 hours per week. These hours are spent sourcing ingredients, stock and items for the business, driving, prepping and cooking food, cleaning, setting up and packing down the trailer, serving customers, meetings, marketing & promotion, administration/accounts, developing recipes, booking events and research. This is only an average, and based on us selling well at an event. A few weeks ago we made a £200 loss on a show, so it’s not always profit. We pay our staff over the minimum wage for the hours they work with us but cannot yet afford to pay ourselves minimum wage. This is not a complaint. We chose to go into this business and we knew it would take time to make a living from it. For the first six months we lived off savings and earned no money, now we earn under half of the minimum wage, hopefully by next year we can pay ourselves the same as our staff. We also don’t get paid when we are ill, on holiday or unable to work. That is what you sign up for when you become self employed and we went into this with our eyes wide open. However, to read comments on Facebook about us having no morals, ripping people off with our food prices and trying to take advantage of fellow vegans hurts when we earn less than half the minimum wage and work double the average working hours per week. No one goes into street food to get rich, we do it for the love of food and to share our vegan message. We do, however, still need to pay our rent, buy food, look after our rescue cats and pay our bills. We are not after sympathy, just an understanding that we are not getting rich or ripping people off. Also we do not force people to buy our products, that is a free choice. So next time you see a street food vendor charging £6 or £7 for a burger, if you consider the product good quality and tasty and you can afford the food, please support them and realise how much hard work goes on behind the scenes to bring that burger to you. Interesting article but preaching to the converted. We run a mobile jacket potato pod, some customers only see a 17p potato, bit of grated cheese, butter and cheap Heinz beans in a bio box with bio cutlery. Charge to customer £4 and we have been told we are cheap. All so simple isn’t it. Great article, as a mobile coffee specialist, our costs and time spent on the business are also higher than people think, and this really puts it into perspective. Keep up the good work! Completely agree with everything said in this article. I own an independent takeaway competing with big brands like Dominos, Subway, Gregs, etc within yards of my shop, as well as local stores and Wetherspoons selling cheap food right across the street. We are open 6 days a week 11am-10pm, that doesn’t include prep time before opening and cleaning down that continues after closing. Our staff get more than min wage too, I certainly get less. I recognise all those costs and more besides. However, I guess we’re all preaching to the choir here. The ‘great’ British public have no idea of the blood, sweat and tears that goes into their food. Customers are also oblivious to the risks we take. We commit large sums of cash in pitch fees prior to events and this is not refunded if the weather is bad or the event organiser’s estimate of attendance doesn’t live up to promises. Event organisers have to take some responsibility for the price of the food we sell, many seem to think they can demand high pitch fees, provide little in the way of services and yet still expect food prices to be low.